On Dec. 28, 2017, Iran’s second most populous city, Mashhad, situated in the northeast near the border with Turkmenistan, was the site of protests that would soon expand to dozens of towns, villages, and urban centers throughout the country. On the first day, three cities held demonstrations. (Some reports say it was five.) On the second day, an additional nine cities saw protests. By the sixth day, they had spread to all corners of the country. Initially, the protests seemed to be focused on economic concerns, namely, the sharp increase in prices of two food staples: poultry and eggs. But within days they turned political, with protesters chanting anti-regime slogans such as “death to Khamenei,” “Khamenei’s regime is illegitimate,” and “free political prisoners.” President Hassan Rouhani delivered a speech acknowledging people’s grievances but stated that “violence and damage to public property” would not be tolerated. Ayatollah Ali Khamenei, the supreme leader of Iran, also gave a rare speech, accusing outsiders of instigating the uprising. Now, the protests have dissipated and it seems that things have largely returned to normal. But while the regime was able to put down the unrest, it has been unable to address its underlying causes: a lack of economic opportunities combined with frustration over the regime’s continued spending on its own defense and foreign interventions in places such as Syria, Lebanon, and Yemen. The regime must choose between increasing spending on domestic economic initiatives that address the concerns of the population, or maintaining the strength—and loyalty—of the security apparatus that ensures the regime’s very survival. Both options come with drawbacks, none of which the regime can take lightly. 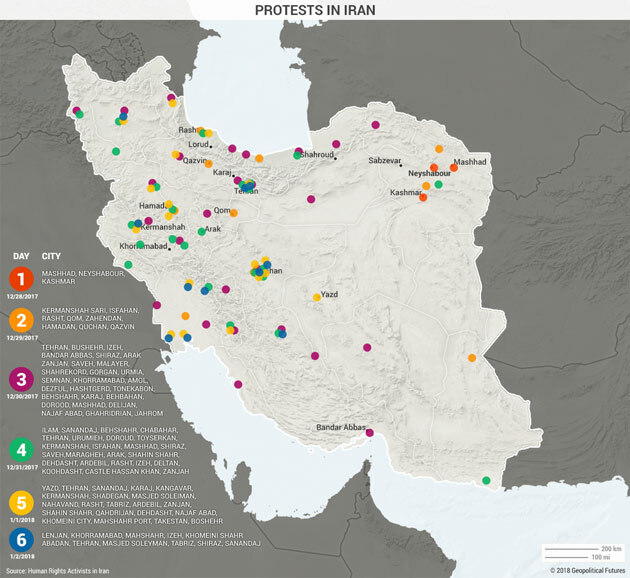 The regime in Iran has a history of suppressing protests and making small concessions to try to relieve the pressure caused by the demonstrations. Its response to the most recent protests is no different. A leaked version of the 2018 budget sparked anger in December over funding for the Islamic Revolutionary Guard Corps (IRGC) and cuts to public subsidies. (Ninety-five percent of Iranians receive such subsidies.) The regime subsequently made changes to the budget, and they appear to address some of the concerns: the planned cuts to cash subsidies will now target higher-income earners; a hike in fuel prices that was in the initial budget has been eliminated; and the government will set aside $3.3 billion to cover two million to three million depositors affected by unregulated credit institutions. But Khamenei also allocated $2.5 billion of the country’s National Development Fund—which was estimated to have $68 billion in assets in 2016—for additional defense spending. Why would Iran continue to increase defense spending if it was the perception of a privileged IRGC—an institution that got more funding while subsidies for average Iranians were slashed—that set off the protests in the first place? The short answer is that Iran has no other option. It’s facing increasing security risks both at home and abroad, and it can’t afford to let its security institutions go underfunded. At the same time, Khamenei instructed the IRGC last week to divest large portions of its business interests, which represent a substantial portion of the Iranian economy—30% by some estimates. The IRGC became increasingly involved in the management of the Iranian economy following the Iran-Iraq war when critical infrastructure needed to be rebuilt. Khamenei’s reasoning for wanting the IRGC to withdraw from the economy is two-fold. First, it attempts to address some of the protesters’ concerns by decreasing the IRGC’s economic power, but without actually defunding it. Second, and more important, privatization is seen as a step toward increasing transparency and, therefore, attracting more foreign investment, which remains at risk due to uncertainty over US commitment to the nuclear deal. Either way, divestment could create even more internal divisions, both between the clerics and the IRGC and also within the IRGC itself, because the organization’s leadership is split on whether to support the move. The external pressures on Iran come from various sources but meet in one location: Syria. President Bashar al-Assad, an Iranian ally, is facing new challenges in western Syria. Turkey has invaded the northwestern Afrin region. Given the size of the Turkish force, its technological superiority, and the relatively small number of Kurdish defenders, it seems likely that Turkey will take control of it. And with that, Turkey will have essentially surrounded Aleppo, Syria’s largest city, on three sides. Surrounding most of Aleppo with Turkish forces would present a major threat to both Assad and Iran. Iran has to consider the risks that a resurgent Turkey would pose to it and will therefore be highly motivated to keep its proxies in Syria and Iraq. Containing Turkey in northwestern Syria is cheaper and safer than trying to fight off Turkish troops in eastern Syria, assuming that they’re able to advance that far. But if Turkish-backed Sunni Arab forces can take control of eastern Syria—the areas that the Islamic State used to dominate—then the Iranian position in Iraq becomes vulnerable. A coalition of Sunni groups in eastern Syria can support the Sunni minority in western Iraq, which would be a threat to the Shiite-dominated regime in Baghdad. Closer to home, the IRGC clashed with 21 IS militants in western Iran on Jan. 27. Iran believes that the fighters emerged from hiding in Kurdish-held areas of Syria, although it doesn’t seem to believe that the Kurds were assisting the militants. The Islamic State has lost most of its territory in Syria, but that doesn’t mean IS fighters have all left the country—they have simply blended into the local population. This was a small skirmish—although three Iranian soldiers were killed—and the IRGC was able to defeat the militants. IS suicide bombers and gunmen attacked Tehran in June, but this was the first time an organized IS militia has attacked Iran, driving home the fact that Iran is still at risk within its borders. The growing IS presence in Afghanistan, a country that shares a border with Iran, is also a concern. While Iran has emerged from the Syrian civil war in a strong position relative to its regional adversaries, its social and political stability has been shaken. Eventually, Iran will be forced to make a choice, and this will limit its foreign adventures just as Turkey, its longtime nemesis, increases its power and its involvement in Syria, presenting an ever-greater challenge to Tehran.